In 1990, when I was getting educated in the alternative media and other areas, I obtained Deadly Deceits, the memoirs of an ex-CIA operative, Ralph McGehee. When I was writing my original web site in 1996, I wrote a brief synopsis of Deadly Deceits, in a section where I outlined the sources that influenced my worldview. I contacted Ralph before I published the pages, asking him if I could publish the Deadly Deceits excerpts that I quoted on my web pages. He replied that it was OK by him, so I did. Ralph is an ex-CIA employee who publicly criticized the CIA, and only a handful ever have. McGehee is interviewed on Bill Moyers' Secret Government video. Ralph maintained his CIABASE archives on the Internet for years, exposing the CIA's activities using public domain sources. In running his CIABASE, Ralph was doing something that anyone could do. Still, he endured endless harassment from the CIA as they have tried silencing him. Ralph had more than my respect; he had my awe. After riding in the saddle with Dennis Lee for years, I discovered how rare a Dennis or a Ralph McGehee was. People of conscience, living it at those levels, are one in many thousands. My web pages came down in early 1997 with no warning, something not entirely in my control. In early 1998, I discovered that some of my work survived and was being reproduced on the Internet. Not only had one person reproduced my entire 600-page web site, I also found that my synopsis of Deadly Deceits was reproduced in several places. I contacted Hank Roth's The Golem web site, one place my synopsis appeared, asking him where he got it. The surprising response from Hank was that he thought Ralph McGehee gave it to him. It turned out that Ralph had published my synopsis of his book across the Internet as the defining synopsis of Deadly Deceits, which is the summary of his career. I was deeply honored. When I discovered that my hurriedly written synopsis still dominated Ralph's presentation of his work on his new web site, I wrote a version of it using more care. It is below. After escalating harassment by the CIA and friends, leading to bodily injury to Ralph, his CIABASE web site went down in the spring of 2000, and will probably never reappear. In August 2001, I received the below statement from Ralph. He wanted to have me post it on my site, and wherever else it can be posted, for his protection. “I moved to Florida in July 2000. Immediately the harassment I experienced in Herndon transferred here. A major difference is that the FBI here openly advises I am a threat to National Security -- because, I assume, I tell unclassified truths to the American people. 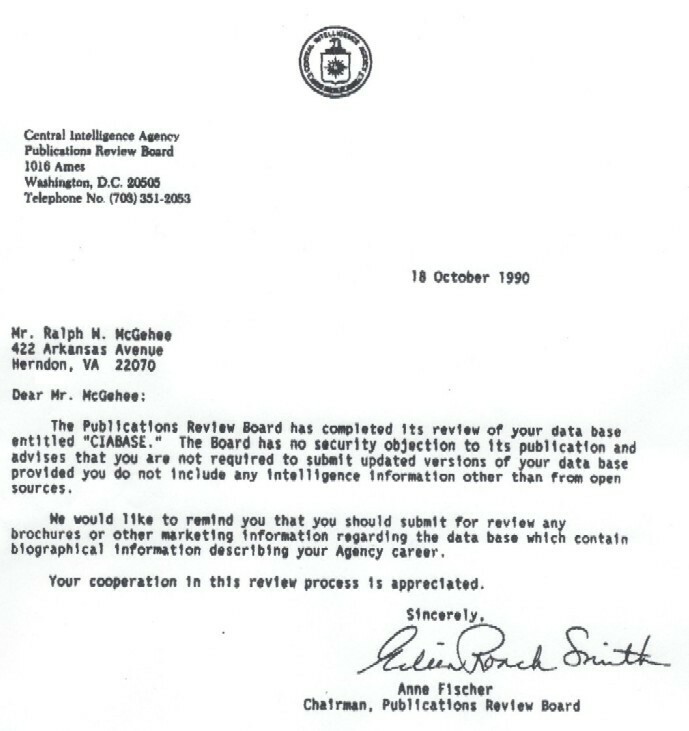 “In 1990 the CIA officially advised me in writing that I may use any information in the public domain -- making the FBI's actions against me false if not illegal as I have never and will never expose secret persons or information. “Harassment here has grown to such a degree that I fear staged incidents to arrest me for something -- anything. “I base my actions on what is in the best interests of the United States. This may be difficult to believe given my negative commentary, but I participated in and watched CIA operations in Vietnam and other countries nearly destroy the US/us. “The CIA said I was an analyst with few peers and awarded me its Career Intelligence Medal. I use this ability and those experiences to inform about the CIA's many opportunities and deficiencies. Ralph has also asked me to post his letter from the CIA that informed him that his CIABASE activities were perfectly legal, and were no threat to “national security.” Here it is. Deadly Deceits became a college textbook. After a moving introduction it starts slowly, climaxing with a series of haunting revelations. During McGehee's twenty-five year CIA career, he heartily believed in its stated mission of "fighting communism." McGehee wrote that CIA fieldworker candidates are psychologically screened before being hired, and their most treasured quality is the willingness to blindly follow orders. Ralph W. McGehee joined the CIA in 1952, after an All-American football career at Notre Dame (where Phil Agee also studied) during their national championship years. He was raised on and believed in the American dream - "the Protestant work ethic, truth, justice, freedom." He signed on as a dedicated cold warrior and spent the next ten years stationed at home and abroad: at Langley (the CIA headquarters in Washington), Taiwan, Japan, the Philippines, and then Thailand. McGehee was dedicated to stopping the scourge of communism, and enthusiastically helped keep the world free of its taint. During the mid-1960s, communism was sweeping Southeast Asia. McGehee's job was saving Thai villages from communist insurgency. He viewed his career as a cross between "Peace Corps and missionary work." Building upon a British method used earlier in Thailand, McGehee developed an inexpensive method of intelligence gathering that identified communists and exposed their network. The strategy was partly intimidating the villagers through terror, such as holding a gun to a baby's head to get the mother to talk, yet was benign when compared to other "counterintelligence" methods of the time, among them torture and boiling suspected communists in oil. The operation's goal was to make communists confess their "crimes," name their cohorts, return to the Thai government's fold and become "good peasants" again. Forgiveness was offered and given to those who talked, with escalating intimidation for those harder to crack. The Catholic Church successfully used a similar carrot-and-stick strategy during its Inquisition days. The Thailand strategy was effective and Machiavellian, something that McGehee crafted and believed in. It obtained a quality of intelligence the region had never seen before. It also reversed communist inroads. The Thai government's brute force response to "communist insurgency," backed by its U.S. sponsors, alienated the villagers, driving them into the communists' arms. McGehee's method was far more subtle and effective. "I explained the procedures of the survey and then outlined my general conclusions, including my doubts about previous Agency reporting which said that the communists did not have the support of the local people and that they forced people to support them with threats and terrorism. "'Such a picture is inaccurate,' I told Colby...'We have found that the Communists concentrate the majority, almost the entirety, of their time winning the cooperation of the peasants.'" McGehee exposed the communist movement as a grass roots movement with peasant support, mainly because their goal was freeing themselves from colonial and neocolonial oppression, enforced by the Thai ruling class and their industrialized-nation sponsors. The Communist Revolution in Southeast Asia was an exercise in freedom, although McGehee would not attain that realization for years. In 1967, McGehee was ecstatic that his method reversed communist infiltration. Colby silently received McGehee's presentation, finally muttering, "We always seem to be losing." McGehee was astonished by Colby's response. Soon after Colby's visit, McGehee was removed from the field, his successful program was canceled, and he found himself behind a meaningless desk at Langley. He was shocked and confused for years. He eventually realized that his intelligence work, although arguably the most effective the West had ever seen in Southeast Asia, produced an undesirable answer. Communism could not be damned as an evil if the people wanted it. If that fact became widely known, our Vietnam adventure could be seen in an unsavory light: killing millions to prevent them from choosing a government we disapproved of. The American experience in Vietnam was an attempt at reconquering the region, keeping it in the capitalistic fold and keeping those people enslaved. McGehee still believed his indoctrination and volunteered for Saigon, something that no sane CIA employee did in 1968. McGehee was a true believer in America's good intentions, even if their tactics sometimes seemed regrettable. Defeating the communists was his great desire. One pivotal evening in his quarters near Saigon in December of 1968, McGehee finally figured it out. "I sat there in agony thinking about all that had led me to this private hell. My idealism, my patriotism, my ambition, my plans to be a good intelligence officer to help my country fight the communist scourge - what in the hell had happened? Why did we have to bomb the people we were trying to save? Why were we napalming young children? Why did the CIA, my employer for 16 years, report lies instead of the truth? "I hated my part in the charade of murder and horror. My efforts were contributing to the deaths, to the burning alive of children - especially the children. The photographs of young Vietnamese children burned by napalm destroyed me." McGehee will never lose the memory of the smell of burning Vietnamese flesh. McGehee thought of killing himself that night in Vietnam. He thought of various ways to kill himself to protest what was happening. In the end, however, he committed his life to telling the world what really happened in Vietnam and the true nature of America's fight against communism. McGehee embarked on the hard, lonely road of exposing what his nation was really up to. "I was glad to be going home. But I knew I would never be the same person again. All of my ideals of helping people, all my convictions about the processes of intelligence, all my respect for my work, all the feelings of joy in my life, all my concepts of honor, integrity, trust and love, all in fact that made me what I was, had died in Vietnam. Through its blindness and its murders, the Agency had stolen my life and my soul. Full of anger, hatred, and fear, I bitterly contemplated a dismal future." The year was 1970, and McGehee had nearly twenty years of CIA service. He spent mere weeks in the United States before returning to Thailand. He sought somewhere to serve out his career's remaining years; somewhere he could stand living. Ironically, he saw the fruit of his anti-communist efforts in Thailand. The peaceful culture of Southeast Asia was destroyed by American involvement. Where McGehee had earlier witnessed pastoral scenes of Thai and Vietnamese people quietly living their lives, Southeast Asia had been turned into an armed camp, with violence, drug use and prostitution commonplace. A barbed-wire fence surrounded the Thai school that his children happily attended on an earlier tour of duty. The students were bodily searched as they entered the school's grounds. The Thai government destroyed the villages that McGehee had "helped" on his earlier tours. He helped establish the framework that destroyed those that he "helped." He became a squeaky cog in the machine and was put on probation. "The CIA is not now nor has it ever been a central intelligence agency. It is the covert action arm of the President's foreign policy advisers. In that capacity it overthrows or supports foreign governments while reporting "intelligence" justifying those activities. [McGehee says he has never once seen a CIA official tell the truth to Congress. Instead comes a steady stream of lies. - Ed.] It shapes its intelligence, even in such critical areas as Soviet nuclear weapon capability, to support presidential policy. Disinformation is a large part of its covert action responsibility, and the American people are the primary target of its lies. "As noted in the Church Committee's final report, the Agency's task is to develop an international anti-communist ideology. The CIA then links every egalitarian [which means "all men are created equal" - Ed.] political movement to the scourge of international communism. This then prepares the American people and many in the world community for the second stage, the destruction of those movements. For egalitarianism is the enemy and it must not be allowed to exist." "The secrecy agreement that I signed when I joined the CIA allows the Agency to review prior to publication all writings of present and former employees to ensure that classified information relating to national security is not revealed. This provision seems logical and necessary to protect legitimate interests. However, my experiences in getting this book approved show that the CIA uses the agreement not so much to protect national security as to prevent revelations and criticisms of its immoral, illegal, and ineffective operations. To that end it uses all possible maneuvers, legal and illegal. Had I not been represented by my attorney, Mark Lynch of the American Civil Liberties Union, and had I not developed a massive catalog of information already cleared by the Agency's publication review board, this book could not have been published." McGehee's dark journey in publishing Deadly Deceits is a damning indictment of U.S. secrecy laws and their enforcement. The CIA tried ambushing McGehee with a room full of lawyers, before they knew he hired a lawyer with the necessary security clearance to represent him. The CIA man assigned to work with McGehee made his feelings plain, telling him, "It's too bad you didn't work for the Israeli intelligence service. They know how to deal with people like you. They'd take you out and shoot you." "John Marks and Victor Marchetti's book The CIA and the Cult of Intelligence, published in 1974 (9 years before McGehee's book), was the last approved critical book written about the Agency by an ex-employee. In light of my own experiences the reason is obvious: the secrecy agreement and the way it is abused by the Agency. It is virtually impossible to write in an atmosphere where everything is secret until it is deemed otherwise....It is clear that the secrecy agreement does not halt the flow of information to our enemies, for it does not affect the CIA employee who sells information...What the CIA's secrecy agreement does quite effectively, however, is to stop critics of the Agency from explaining to the American public what the CIA is and does. It is sad to say, but the truth is that the primary purpose of the secrecy agreement is to suppress information that the American people are legitimately entitled to." For all the mainstream media's rhetoric regarding the First Amendment, freedom of speech in America has had a rough ride. From the Sedition Act of 1798, making it a crime to criticize high-ranking American officials (not dealt with by the U.S. Supreme Court until 1964, in the New York Times versus Sullivan decision), to pre-Civil War Southern laws making it a crime to speak or write about abolition, to the Espionage Act that made it a crime to criticize World War I, freedom of speech has often been more imagined than real in America. During my lifetime, freedom of speech has waxed and waned. The Freedom of Information Act (FOIA) would be unnecessary if the principle of freedom truly guided the American legal system. The FOIA was originally passed during the Civil Rights days of the 1960s. The Nixon years saw the FOIA erode. The aftermath of the Watergate scandal tipped the scales back toward freedom. The Carter years saw a new openness in government and a focus on human rights, but that is relative. Under no U.S. president have we truly had freedom of information, nor have human rights concerns ever prominently guided America’s foreign policy. Knowledge is power, and keeping information secret is a time-honored method of amassing and maintaining power. The United States is no exception, and there is no reason why it should be. People can wave around the Constitution, but America’s freedom of information is scant for a nation that calls itself democratic, and has gotten worse since the World Trade Center attacks. America’s military and spy establishment has the largest secrecy apparatus of any nation, by far. The rich and powerful run the Democratic Party, the same as in the Republican Party, but the Democratic Party sometimes has at least an appearance of allegiance to average Americans. The FOIA has endured many vicissitudes in my lifetime, with the Reagan-Bush years witnessing the greatest assaults on the FOIA. The Reagan administration even tried reclassifying previously declassified information used in McGehee's book, to enter bizarre, Orwellian realms. Bludgeoning Central America was one of many dark acts committed during the Reagan-Bush years, and secrecy was its handmaiden, evident in the Iran-Contra scandal, among others. Although the pendulum swung marginally back to freedom's side during Bill Clinton's reign, freedom of speech in America is a farce if one offends or exposes the powerful. Today, the "anti-terrorist" legislation Clinton has championed, and his recent "Fortress America" ideas of protecting America from "terrorists," can easily be used to silence American critics of our government, by calling them "terrorists." Those fears, voiced continually in right wing circles, are not so farfetched (events since the World Trade Center attacks make the above writing quite dated, as Bush, Ashcroft and friends seem to be trying to raise McCarthy from the grave). To date, Ralph is one of a handful of ex-CIA employees to publicly criticize the CIA. Ralph does not agree with me, but I believe he did not attain his realizations due to his intelligence, which is considerable. He figured it out because he fervently digested his indoctrination and believed that his efforts made the world better. Because he was such a true believer, he chased experiences (such as volunteering for Saigon duty in 1968) that eventually provided him with his devastating revelations. When he realized that his efforts helped murder millions of people in Southeast Asia, his conscience assailed him. His pure heart enabled him to figure it out, not his intelligence. I can only wonder how often Ralph thinks back to those Southeast Asians that he "helped," abetting their horrific experiences at the United States’ bloody hands. He probably thinks about it every day. His CIABASE and other efforts have been attempts to help balance his scales, while helping us awaken, to help prevent further murders in greed's name. Unfortunately, it is happening in Iraq today, and Armageddon might be just around the corner. Ralph's weathering of the CIA's continuing harassment has been inspiring. John Stockwell (another rare ex-CIA employee who spoke out, and has paid dearly for his efforts) has written, "More effectively than any other ex-CIA author, Ralph McGehee deals with the anguish of a principled man seeking a career in the CIA." Ralph is the rare individual possessing the integrity to walk his arduous and heartbreaking path. Of the many thousands who have filed through the CIA's ranks during the past fifty years, Ralph is in an elite company of less than ten people who woke up and took a public stance. That list includes Philip Agee, John Stockwell, Victor Marchetti and David McMichael. There are not many more, and probably no others of their stature. They have my admiration, and even my awe. None of them think of themselves as heroes. As Noam Chomsky says, their motivation is partly being able to look themselves squarely in the eye while shaving. They are responding to the insistent call of their consciences, and feel compelled to act. Ralph McGehee and those few others like him rarely see themselves as heroes, but are doing what any decent person would do. The problem is, few will do the decent thing if it might really cost them. I will always be grateful for the "heroic" efforts of McGehee, Chomsky, Agee, Stockwell, McMichael, Marchetti, Dennis Lee and others. They helped me figure out how our system works.